It really wasn't bad though. The weather was nice and they had chalk outside so my kids were happy. 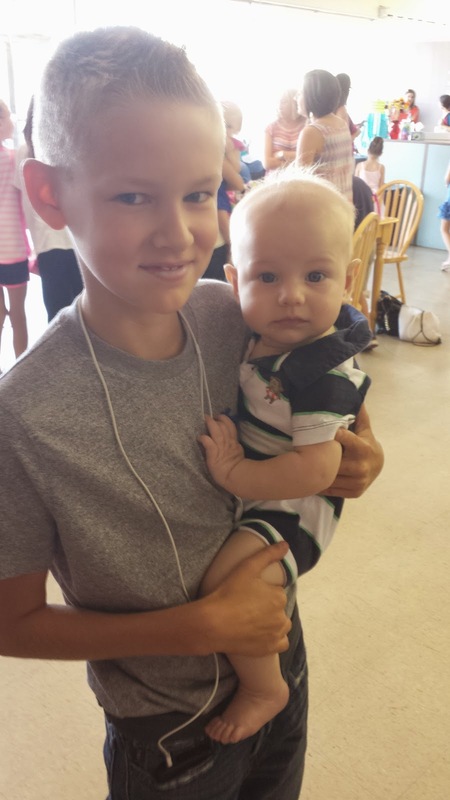 Then inside I saw one of my adopted teens and offered her $5 to keep tabs on Sarah and Cody. So every so often I'd holler at Abby and she'd find my kids make sure they were ok and it stopped me from having to get up and go hunting for them. And only one time did I have to tell Abby to go get them out of the parking lot, so I call that a win. Plus, I was able to just hang out for the time and chat with Annie and a few other moms I hadn't seen in a while. Not bad. Not bad. They changed Sarah's dance class this year. 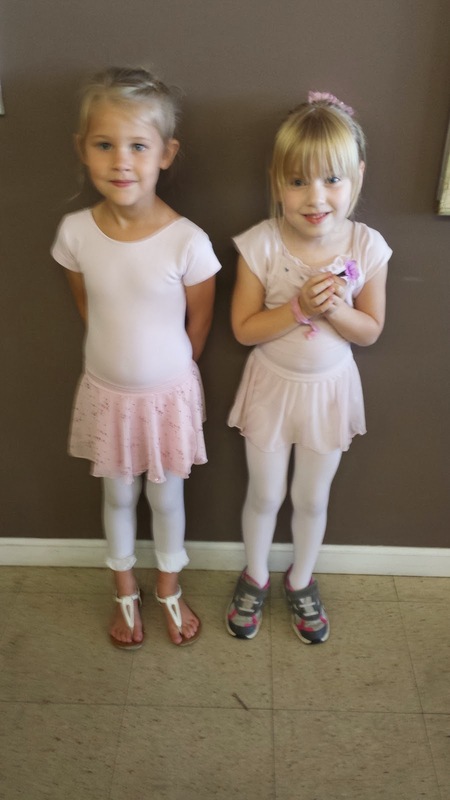 For the past 2 years the tippy toes class has been ballet, tap, and creative movement. They've dropped that format. Now it's ballet with creative moment, or tap with tumbling. I knew ballet was going to be the more popular option so that's why we went to registration early. It started at 10, we got there at 10:30, and when it was our turn to register, there were only 3 spots left in the 5 year old ballet class. Whew. We barely squeezed in. Sarah is happy. She seems to enjoy dance more down then before. And since I've been letting her watch So You Think You Can Dance with me her moves have become more, shall we say, varied. Yes, that's a nice way of putting it. Anyway here's my traditional first day of dance pictures so I have something to compare them too at the end of the year. And I'll just sneak in a picture of Charlie because it's cute. I thrust him upon Will so I could take the above pictures. Both of them are good sports. 3 hours?!?! lol were there just that many people there or was there only one person handling registrations? haha I know, we can't complain about that stuff when we choose to sign our kids up but wow, that's a long time, lol. 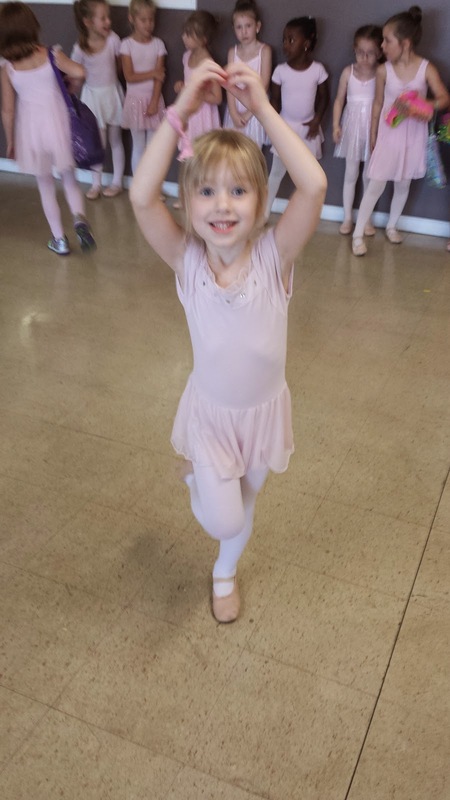 But she is a pretty cute little ballerina. I miss my daughter taking dance, sigh. Hannah told me that Sarah was amazingly good with Abby helping in the room last week!